If you are reading this, the world did not come to an end because of Y2K. Updated News Break: We expanded the News Break into a bigger, better format, and we are pleased to bring you this new and exiting version. Expanded Facilities: We have been "under construction" to add a needed 5,000 square feet of space. The additional space will help us to design and manufacture more projects in a timely manner. Expanded Product Line: We have added a new item to the Extendavator product line: the 3rd Stick. The 3rd Stick can add up to 35' of pivoting reach to your machine, and is special because it is designed to pivot at its connection to the dipper. 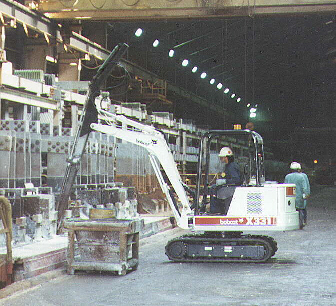 The attachment has the capabilities of working between the machine's tracks at ground level. To see a photo, click here. ....We are pleased to send you this issue of News Break. In this issue, we are committed to bringing you information that will help make your job easier just as our customized products do. ....Once again the past year has proven to be successful for our company, and we would not have the prosperity and good fortune without the help and trust of our customers and suppliers. All of the staff would like to express our sicere appreciation to all of you. As we go forth into this new millennium, PWCE wishes you the best of luck in everything you do. ....Approximately seven months ago, New Holland N.V. and Case Corp. announced plans to merge into a $12 billion global equipment company. ....The Road Machinery Division of Ingersoll-Rand Company recently celebrated the 25th Anniversary of its Shippenburg, PA facility. ....Komatsu America International Company announced that effective Oct. 1, 1999, it will no longer use the Dresser trademark for its line of wheel loaders and crawler dozers. The new trademark will be Dressta. ....According to Komatsu America, the change will have no impact on the products currently manufactured under the Dresser trademark. Except for the Dressta trademark, all of the current product nomenclature will remain the same. The Extendable Paw is a cost effective way to add extra reach and digging depth to your mini-excavator. Compare the cost difference between the Extendable Paw and buying a larger machine to get the extra reach. We build the Extendable Paw with the same high standards as our Extendavators. For more information call 1-800-990-PWCE. Loweer operating costs because of added vehicle control and operator comfort for higher production efficiency. 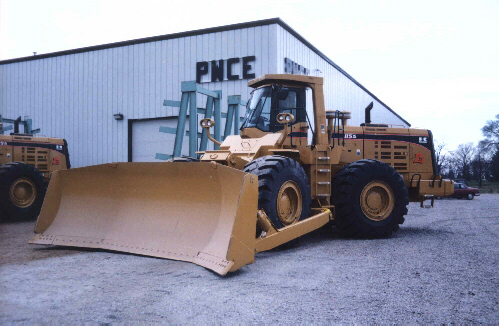 PWCE can custom build a compactor for you with job specific options, all you have to do is call. Cab sits 4 to 8 feet above regular position for better visibility of work site. Objective: Finding a way to help construction companies work more efficiently is one of PWCE's main objectives. Our engineers worked to develop a product that would utilize an existing machines capabilities. The end result was a long-reach attachment called an Extendavator. Satisfaction: Unique personal service is a trademark of PWCE. Any contractor who has ever said, "I wish I had a Piece of equipment to ..." should be happy to know that innovative creative solutions and imaginative engineering expertise are just a phone call away. We have never had a request we couldn't address or answer, and we like to provide customers with the special kind of individual attention they deserve. 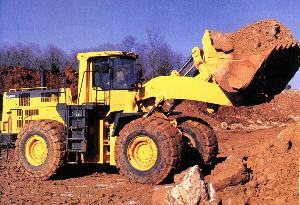 Do you own a worn out wheel loader? Why not consider converting it into something else? We can convert many different machines, all you have to do is call. For more information, contact us at 800-990-PWCE or email Paul Imm at pimm@pwce.com. ....JCB was the official heavy equipment supplier to the Metro Atlanta Super Bowl XXXIV Host Committee. As part of its host sponsorship, JCB machines took part in displays, demonstrations, and completion of work at affiliate activities leading up to the big game. ....Some activities which features JCB's expertise are the Christmas in April Home Refurbishment Program, Habitat for Humanity's Local Super Bowl Build, and the Bash on the Beach. JCB also staged a performance by its unique Dancing Diggers. ....Celebrating 75 years of Caterpillar machinery, the Antique Caterpillar Machinery Owners Club (ACMOC) will gather one of the largest collections of antique tractors and machinery manufactured by Caterpillar for a millennium event. From August 25-27, 2000, at Three Sisters Park in Chillicothe, IL, the Caterpillar machines are coming home to the Peoria, IL, area. ....ACMOC expects more than 200 machinery exhibits and will not only have them on display, but will present live demonstrations. For more info on the event, call 1-800-747-0302, ext. 111. ....If you cross state or regional lines, you've probably experienced the hassle of tracking down the regional or state specific one-call numbers before digging. Now a toll-free phone call to 1-888-258-0808 will put you in touch with an operator who will give you the local one-call number. ....A "Call Before You Dig" decal can be obtained through equipment dealers or manufacturers. ....With the help of PWCE, a magnesium production company has moved its employees to a safer working environment. Kawasaki's site contains information and specs on their wheel loaders, a dealer locator, and a used equipment locator. 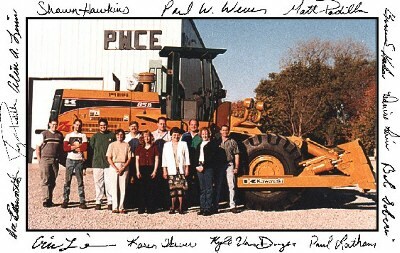 PWCE's site has information on customized products, services, parts, and a photo gallery. Equipment News-Record's (ENR) site includes headline news, project bids, and links to other costruction sites. World of Concrete 2000, the construction industry's largest annual international show on commercial construction, will take place at the Orange County Convention Center, Orlando, FL. For additional information, call 1-800-837-0870, ext. 2653. Equipment Demonstration Exposition, a trade show where customers can see and operate construction equipment, will take place at the Kentucky Exposition Center, Louisville, KY. For more information, call 1-888-771-DEMO. FOR A FREE SUBSCRIPTION TO THE PWCE QUARTERLY NEWSLETTER, PLEASE GIVE YOUR NAME, ADDRESS, COMPANY, AND PHONE NUMBER TO SHAWN HAWKINS - EDITOR.